"Multihued light radiated up from beneath the water, centered among the reeds, and then diffusing outward as it reached the surface. Violet had never seen anything like it, and she knew that the spectrum of light was defying its very nature by behaving in that way. It could only be one thing. There was something dead down there." I'm starting this book today, and I am SO excited to read it! What's your teaser for today? Leave me a link so I can return the visit! Thanks for stopping by! I loved The Body Finder, really looking forward to getting Desires of the Dead. Very interesting teaser, and I also love the cover! Oooh! That's a really beautifully descriptive teaser! Until the end where it gets creepy, but it's still really intriguing! Thanks for stopping by! I have this one waiting in my TBR pile. Hopefully I'll be able to get to it soon! I just picked this up in paperback last week. I'm excited to read it. I hope you're enjoying it. Great teaser, too! 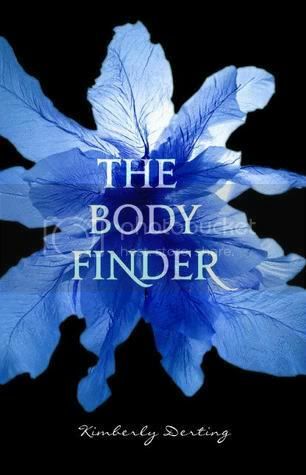 I've been wanting to read The Body Finder :) Excellent teaser! New follower, btw! omg this is one of my favorite books, i hope you enjoy it! Awesome teaser! Read another teaser just awhile go from the same book! I loved this one! And the sequel is equally good! Thanks everyone for stopping by! I enjoyed reading everyone's teasers today! I LOVED "The Body Finder"! Great teaser! I you find it as entertaining as I did! I haven't been able to read this book, yet. But I plan to. :) Great teaser! I'm about halfway done with this one and it is amazing so far! Your teasers a good one. I've been hooked this entire time. I been meaning to read this book, it's sound really interesting.